Welcome! The day is here for my stop on the 100 Blocks Blog Tour and I am so glad you are here! I'm thrilled to have my block, Hexie Flower Basket, published in Quiltmaker's 100 Blocks, Volume 14 Winter 2016 edition. Quiltmaker assigns each 12" block to one of four categories - Applique, Foundation-Pieced, Mixed Technique and Pieced. Hexie Flower Basket is included in the Mixed Technique section since my block contains traditional piecing and both hand and machine applique. 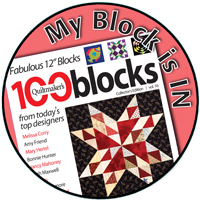 My block, It All Adds up, was included in Pieced section of 100 Blocks Vol. 13. Here, I was auditioning the placement of the hexagon flower on the basket. You can also see the scrappy background which was pieced from a charm pack of Modern Background Paper by Zen Chic for Moda Fabrics. I wanted the leaves to contrast with the gray basket fabric and compliment the hexagon flower made from two Cotton and Steel prints, Dining car in Coral and XOXO in Dandelion. I chose this bright green Grid from the Spin collection by Windhan Fabrics. Once I received my copy of Quiltmaker's 100 Blocks in the mail and actually saw my block in print, I realized that I had gone to all the work of piecing the background and there really wasn't enough contrast. I decided to make another block, this time using two alternating prints for the background. Although subtle, there is enough contrast to see I actually made the effort to piece the background. With the exception of the solid fabric used for the basket handle, this Hexie Flower Basket block is made from various Cotton and Steel prints. For this hexagon flower, I fussy cut the flower petals and describe my fussy cutting method in yesterday's post using an acrylic template and hexagon papers by Paper Pieces who is generously sponsoring a giveaway for both! Giveaway #1. 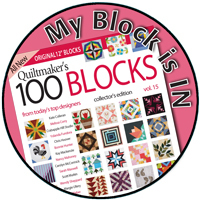 The editors at Quiltmaker are sponsoring a giveaway for one copy of 100 Blocks Vol.14 and will mail the magazine directly to you anywhere worldwide. Giveaway #2. 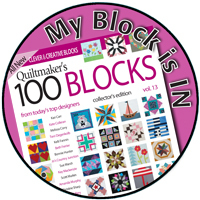 I will mail a copy of Quiltmaker's 100 Blocks Vol. 14 to one lucky commenter to anywhere worldwide. 1. Leave a comment letting me know if you have ever made a basket quilt block. 2. Followers, old and new alike, get a bonus entry. Leave a second comment and let me know how you follow - such as Bloglovin, Instagram or Email. The giveaway will run through Wednesday, November 23rd and close at 8pm. (Giveaway now closed.) I normally respond to every comment received, but during the giveaway the volume may be to large for me to do so. Please leave your e-mail address so I have a way of contacting you if you are a no-reply blogger. 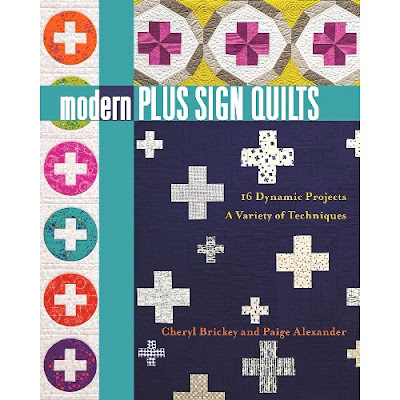 Visit Quiltmaker's blog, Quilty Pleasures, each day this week for links to participating blogs and enter for some great giveaways! To see all of the creative and original blocks in this issue, 100 Blocks Vol. 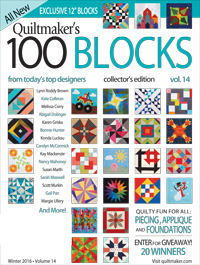 14 is available on the newsstands now or you can order 100 blocks from Quiltmaker. I made a basket block in my first sampler quilt. That was a long time ago. I would like to make a basket quilt next year. I've never made a basket block. Thank you for the chance to win ! I follow you on Blogger. Thank you Paige ! No, I haven't made a basket block, but your purple flower with alternating fabrics ,in the top section, and another fabric with little lines on it so appeals, I might have courage to try one. I follow you with Blogger . 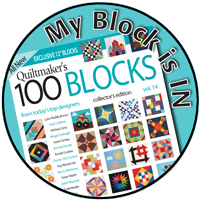 Congratulations on having your block included in Quiltmaker 100, Vol. 14! Yes I have made several projects with baskets. I love doing EPP as well and have several sizes of hexies in the works. I have made a basket block a long time ago. Thanks for the giveaway! I have made several basket blocks. I took a class, we made a basket sampler. Your block is Pretty! i have make a basket block in a block of the month quilt, yours is very pretty, I love hexagons. Thanks for the giveaway! Basket blocks are one of my favorite to make because you can leave them plain or add a bit of applique to dress them up a bit. I just love baskets and have made a few, but still some more on my list. I love both of your versions very much! Great block--love the one with the fussy cut hexies! I have not yet made any basket blocks, but love them! I have never made a basket block but it's on my long list of to do blocks. Your block is so lovely. I got into EPP a few years ago and fell in love with the hexi flowers. Your block is very cute and I like the background the way you did it. I have never made a basket quilt but they sure are nice. Thanks for a chance to win. Yes I am making a basket quilt and am looking for new basket blocks to make it bigger. Now I will have yours , thanks. I love your block. I have made basket blocks but not using the hexies. Great block. I have never made a basket quilt, I never really cared for them, however after seeing your modern take on this I might just have to reconsider!! 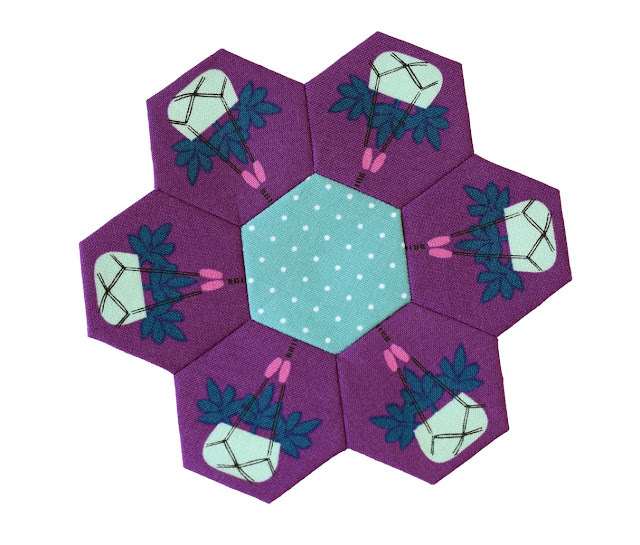 Hexagons are a great opportunity for fussy cutting! I have made several 4" basket blocks which are in my sewing baskets quilt. Your blog is listed in my sidebar. I've never made a basket quilt although I've seen some beautiful ones that could make me reconsider, your block is wonderful. I have never made a basket quilt block before but yours will be my first! I am a follower on Bloglovin too! One of my first quilts was a basket quilt. I learned a LOT and my points are now much better. I follow you via Bloglovin'. Thanks for the giveaway. Congrats on another wonderful block in 100 blocks! I have made a few basket quilt blocks. One of my favorite blocks. Like your fussy cut hexie a lot. I follow you by email and on Bloglovin! Yes, but it was only one block in a sampler. No, I have never made a basket block. One of my pleasurable activities is growing and taking care of flowers and I have always liked baskets. So you would think the basket block would have caught my attention, but no. I do however like the way in which you pieced your background first and then did the applique (another part of quilting I really enjoy doing). So, I may just have to give your pattern a try! Thank you for sharing and the great give away opportunity! Have a fantastic creative day! Cute block Paige. Thank you for the giveaway. Yes, I have made a basket block, several of them in fact. I love making them and adding different flowers to them. Baskets seem to be popping up everywhere. I love yours! Maybe I'll try a basket block. I have never made a basket block. I've never made a basket block before. 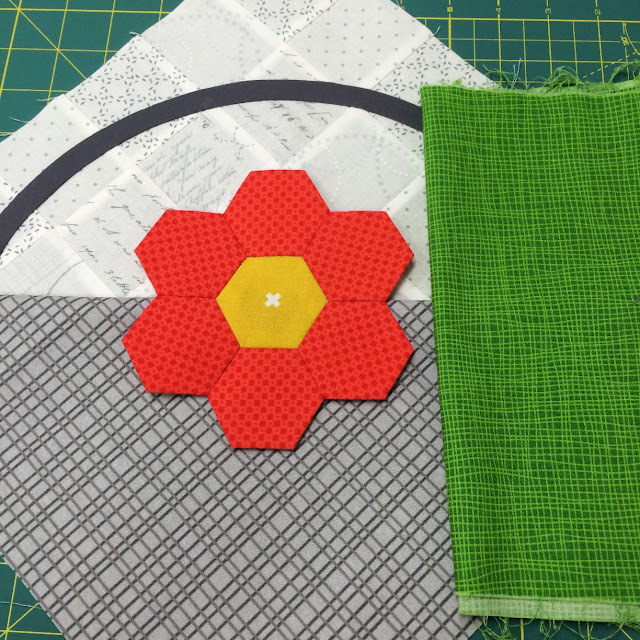 I love to make hexies, but I've never fussy-cut one--yours look great! So beautiful,love them all.I have made a basket block to add it on a sampler quilt but without your great idea with that cute hexies. I have never made a basket block, but need to try one! I love yours. I do follow your blog.Thanks! Wow, that purple flower is stunning! I've never made a basket block but for a long time they were a favourite when I first started out quilting. Hi Paige, I have never made a Hexi, but yours sure looks cute! I have not made a basket block. I have made a small basket block quilt a few years ago. Your block is so sweet! I have never made a basket quilt block but yours is adorable! I love the one hexies with the hanging baskets in them. Oh yes--I've made many baskets over the years--your block is adorable! I have made basket blocks, and in fact, the quilt is in my UFO collection. I haven't made hexies with paper though. Love your block very much. I like seeing the blocks made up. I'm a new email follower. 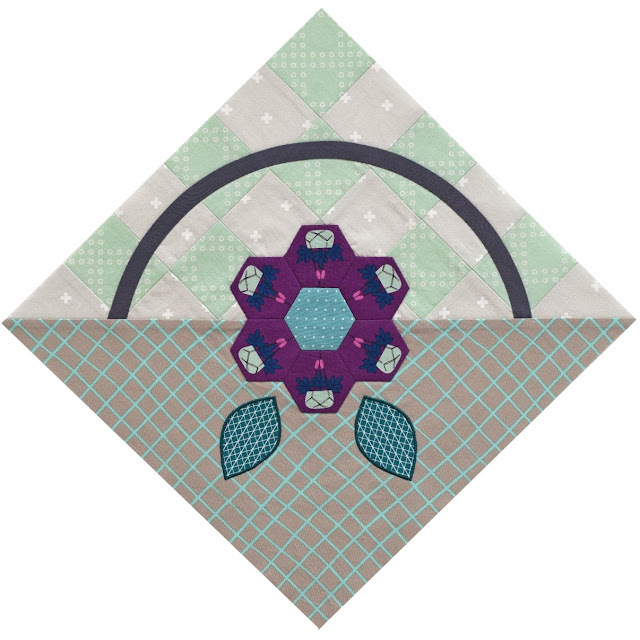 I made an appliqued basket block once for a swap but I have never made a hexie! this would be a good block to start with. congratulations. this is a very pretty block. No I have not made a basket block yet. but this looks like a lot of fun. I have never made a basket quilt block, but this one looks beautiful! I have made a basket block but it didn't have a handle, so no bias stem to work with! I actually think your original pieced background is perfect - my eyes catches the lights/darks without it ovewhelming the beautiful basket and flower. Lovely! when i took my first quilting class it was hand quilting and i did make some basket blocks. I've made my first basket blocks with patterns from Pat Sloan's Splendid Sampler Quiltalong. They're some of my favorite blocks! I'm a new follower by email. Hi Paige: Yes, I've made several basket blocks but none with applique. I really like the low volument background on your published block. Congratulations on having your block included. I have made basket blocks and have a small quilt that I made years ago. I like yours very much. Thanks! Hi! I made a basket quilt block long ago when I made wallhangings for each month of the year. Very nice block! I haven't made a basket quilt as yet, but it is fourth on my bucket list! I made a queen size quilt last made with basket blocks. I used 30s re pros and it turned out great. I have made a basket quilt. Like your idea for hex-flower. I have a few that need a home. Like a table runner. I haven't made any basket quilts but I might try your hexie flower basket in a small project. Thank you for sharing. I like to make basket blocks but it has been awhile. I have made a basket before. I've never made a basket quilt. And I actually like your first very subtle pieced background! I have not made a basket block but with your hexies for inspiration I just might have to do so now. a basket--and hexies--I will be making this block for sure!! Yes, I have made several basket blocks. Your block is really cute with the hexagons. Thanks. I love your basket block! My basket quilt came from a pattern by The Buggy Barn, and I love it! Your block is adorable! I have made basket blocks - for the Bitty Blocks quilt-along last year. I do not believe I've ever made a basket block. I do love this one--simple but oh-so-many possibilities for personalization. Nice beginner project. Does it count if I have an unfinished basket block quilt on my sewing table, waiting to be assembled? It is my first appliqué quilt to speak of, lots and lots of little baskets. I'm still trying to decide on a center block to add some pizzaz. Maybe a basket with hexies might do the trick. Congratulations on a great block! I have never made a basket block. Might just have to do that tomorrow. I've never made a basket block. Thanks for showing your hexie version. Very sweet. I have made a basket block. It was one of the very first blocks I tried to make. I figured out how to comment!! And no, I have not made a basket block, but hexies are the first type of block I was going to make YEARS ago, when I was a child and wanted to quilt. And I actually like the subtle background in the photo of the first block you created but I also like the 'new' block you made with the fussy cut pieces for the flower! 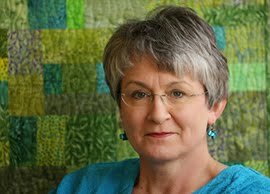 I to am enjoying the 'modern' style of quilting - and you keep doing what you do. It all looks good to me and makes me want to - OH!!!!! I have made a basket block!!! It was in a mystery I did!! And I had to laugh when I was done because I said if I had know it was going to have baskets, I wouldn't have done it!!! Well, I am glad I did and I am glad I remembered I had!!!! Hexies, I have not made. And have fun with all your comments!! Yes, basket blocks are some of my very favorite scrappy blocks to make. The East Cobb Quilters' Guild in the metro Atlanta has a basket block as it's symbol... so I've had the pleasure of doing several during my years of membership. I'm just now playing with hexies but I'm making mine by following the "folded circle method"... so this could be a cute use of my growing hexie collection. I once designed a paper pieced flower basket block and made a bunch of those. I have also used the block to teach beginners to paper piece. 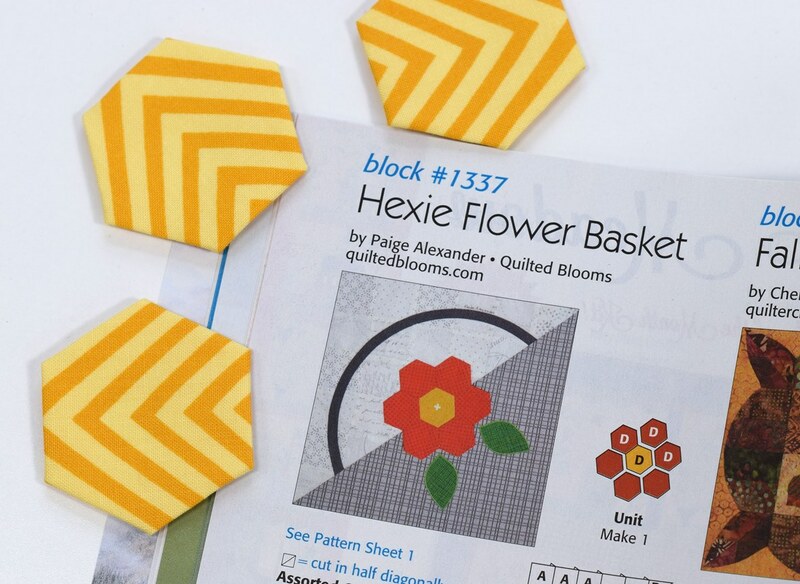 I like the hexie flower in the basket - might be time for me to try hexies! I don't think i've ever made a basket block. I haven't been brave enough to do hexies either, though I do love them. I have not made a basket block but a basket quilt is on my bucket list! I have made basket blocks, but I never would have thought to use Henie flowers. Very clever! What a pretty block. The first quilt that I ever made was the Flower Garden block. Little did I know that was a hard quilt to make and I was making it on a treddle machine! I have never made a basket block but there is always a first time. Thanks so much for sharing your talents with me. Very pretty block. I haven't made any of the basket blocks, yet. I haven't done baskets but I just love the hexie flower! I added to my bloglovin. Thanks so much for sharing! I love basket blocks! I have made a few! I have made one applique basket block but not a pieced one yet. I really like how yours turned out. Both color ways. Your basket with the hexie flower is adorable. I enjoy hexies so I know I would like to make your block. I've made an appliqued basket embellishment for a dish towel, but not a basket quilt block. Thanks for sharing. No but I'm going to try this one. I have made a basket block (years ago) but it was far from the modern beauty of this block. I really want to make one or three. I'm thinking maybe a table runner or wall hanging. BTW I can see the pieced background just fine in your first block. I have lots of this print fabric that would make a fantastic background. I follow on Bloglovin'. Thanks for hosting the giveaway and for visiting my blog. Your sweet comments are appreciated! Pretty block. Yes, I've made a basket block - much simpler than yours. Thanks. I'm a follower of your blog via Feedly. Thanks again. I don't think I ever have made a basket quilt block. Congratulations for being in the book! I have made a basket quilt - my first lap-size quilt. I like your basket block. I follow you by e-mail. I have made basket blocks over the years --- some for an exchange or to be part of a donation quilt. I have not made a whole quilt of only basket blocks. Yes, I have made several basket blocks. I really like them! 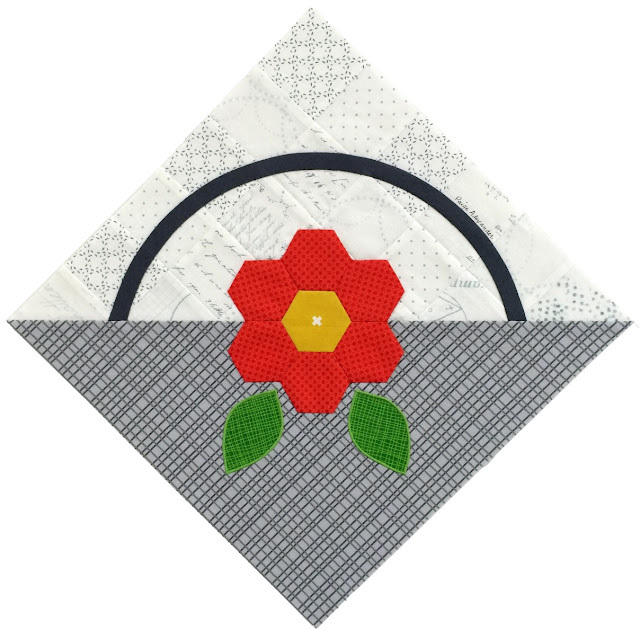 Love the pieced background and the hexies on your block. Yes, I have made large baskets for a folk-art quilt. Love your block! Just stopping by to say, "Hi!" No need to enter me in the giveaway. I've never made a basket block, but I love the versatility of it. It looks completely different when you change the fabrics. FYI, when saw your block in your blog my first thought was how much I liked your scrappy white and gray background fabrics. Too bad the magazine picture didn't do it justice. I'm a dedicated follower! Thanks for the giveaways. I've never made a basket quilt. Your design is intreging. I made one basket block many years ago. It was in a sampler wall hanging. I've never made a basket block though I have made the hexie flowers. Maybe its time to try out something new. I like the look of this block - its both traditional and modern. I have made several basket quilt blocks for online swap partners. The fussy cut hexy petals get 2 thumbs up from me. I haven't made a basket yet, but it is on my to-do list! I really like basket blocks & have made a few of them. Someday I'd like to make an entire quilt of baskets. I haven't made a basket yet. I think your baskets are lovely. Bloglovin follower: Nicole Sender & new e-mail subscriber. I haven't made baskets, but I do love how pretty they are. It is something I will get made one day. I've never made a basket quilt block, but I have a quilt made by my mom with those kinds of blocks that I treasure. And I follow you through Bloglovin. I've never made a basket block but love this one. I have never made a basket block but your block is beautiful. I've never made a basket quilt before. I have made a basket block and a few hexies as well. new to the quilting world and I haven't made a basket block, yet. I have never made a basket block yet but I will someday. HAHA Thanks for the chance to win, since Hasting's closed there are no local places less than 60 miles to get magazines. I have yet to make a basket block. It's on my lengthy list of to do's. Since I am new to your site, I am not sure just how I will be able to follow you. I have never made this block but I am absolutely going to! 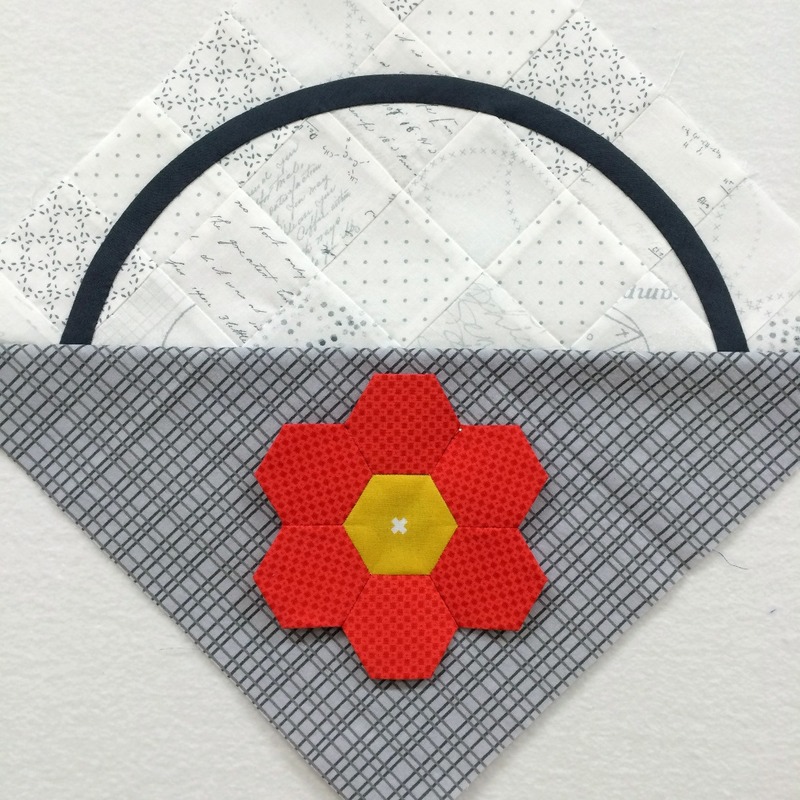 I LOVE hexi's and this is my favorite block so far! The only basket block I have made to date is using appliqué. Your blocks are lovely Paige, as always. I have made an entire quilt of basket blocks. I have started one, but I never finished it. It was one of many blocks in a beginning techniques class. I have made a handful of little 3" basket blocks. They are so cute! Love your basket with hexies. I think I've made a basket block as part of a BOM quilt I taught once. LOVE your block, Paige! I made some tiny basket blocks as part of a sampler once. They each finished at 3". I follow Quilted Blooms by email and on IG. I have made basket blocks.